It was 1995, and I was in graduate school at Brown University. I was taking a gender studies course that claimed gender (male and female) is a social construct not a biological difference. I was a nice Italian girl who grew up in North Providence in an assertively pink bedroom. My head would throb every time I left this class. One afternoon several of us gathered for a study session where a few of the students brought vegan snacks and refreshments. I was already a vegetarian, so I was excited about exploring vegan food. They served a disturbingly gray mock chicken salad, carrot and celery sticks, some sugar-free fruit juice cookies, and a funky smelling "revitalizing" tea. Never had I more intensely craved a Dunkin' Donuts hazelnut coffee and sesame seed bagel. I chose the cookie. It looked good, all chunky and nicely browned. I took a bite. It was chalky and dry. I chewed and chewed. I tried to swallow, but I couldn't. It was glued to the roof of my mouth. I grabbed a cup of the revitalizing tea to try to wash it down. Nothing happened. I thought, I'm gonna choke to death at a study group eating a vegan cookie. Damned vegans. Eventually I managed to swallow it. 16 years later, I've learned that vegan food can be delicious, and while I'm no longer a vegetarian, I still love eating vegetarian and vegan dishes. 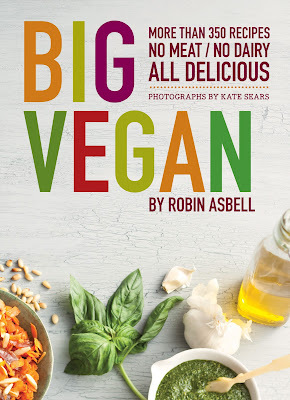 So I'm happy to add Robin Asbell's colorful new cookbook, Big Vegan (Chronicle Books, September 2011), to my shelf. Asbell has created 350 meat-free, dairy-free, 100% delicious vegan recipes which she organized into categories including Breakfast, Breads, Salads, Soups, Main Dishes, Desserts, and more. Though Asbell states the benefits of adopting a vegan diet -- it's healthy, it doesn't harm animals, it leaves a smaller carbon footprint -- she isn't preachy. She advocates veganism more for its health benefits than for its political ideals. Whether you're a veteran, newbie, or part-time vegan, Asbell's book will suit your needs. She covers all the basics of cooking vegan, including special ingredients to buy such as nutritional yeast, seitan, and soy and tips for successful vegan baking. She also includes a lengthy section on the nutritional components of a vegan diet. Asbell's recipes are inspired. Who wouldn't want to wake up to an Almond-Apple-Date Breakfast Burrito or a bowl of Fruit-Sweetened Chai-Spiced Granola with Pecans? How about sitting down to a dinner of Harvest Vegetable Stew served in Mini Pumpkins or a dish of Corn and Cauliflower Stir-Fried Noodles with Peanuts? Asbell pays homage to many global cuisines. From Greek Beet and Orange Salad and Tuscan Potato Gnocchi to Tibetan "Beef" Fried Noodles and Szechuan Eggplant with Peanuts, you'll find bright, tempting worldly flavors. Some ingredient lists are long, but most are short, and all recipe instructions are lucidly written and easy to follow. The book's design reminds me of a Mollie Katzen book, clean, simple, and inviting. Kate Sears's photographs are beautiful; I only wish there were more of them. In the comment section below, tell me why you'd like to win a copy of Big Vegan. Tweet about it and mention @foodblogga, and I'll count that as another entry. I'll announce the winner on Sunday, October 30th. Photo courtesy of Kate Sears. 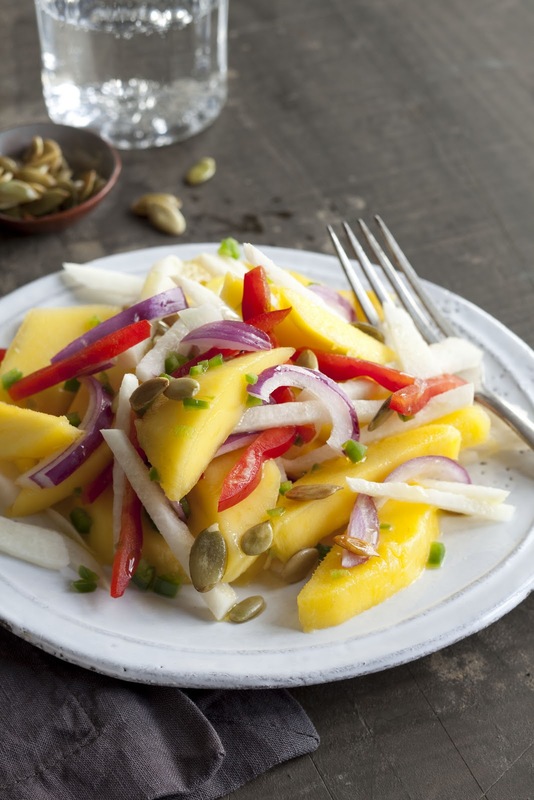 I adore this zesty Mango Jicama Salad with Lime Dressing and Pepitas. It's a symphony of colors, textures, and flavors that leave you refreshed and satisfied. 1. Peel and thinly slice the jicama, then stack the slices and slice them into 1/2-inch sticks. Put them in a large bowl. 2. Slice the mango flesh across the grain and add it to the bowl, along with the bell pepper, onion, and jalapeno. 3. In a small bowl, whisk together the lime juice, sugar, and oil. Pour the dressing over the mango mixture. 4. In a small frying pan over high heat, dry-toast the pumpkin seeds, swirling and tossing them in the pan. When the seeds start popping and are toasted and fragrant, pour them onto a plate to cool slightly. 5. Serve the salad topped with the crunchy seeds. *Click here to follow Big Vegan's virtual potluck. *To learn more about Big Vegan, check out Robin Asbell's YouTube video. I was vegetarian for about 15 years, and we try our best now to know the farmer of any meat we eat. As my hubby's cholesterol continues to go up, I'm looking for more vegan recipes that he would enjoy. While my family of 5 has made the transition to vegetarianism fairly easily, we've had a hard time giving up the cheese and yogurt! My husband and I have talked quite a bit about making a full commitment to a vegan diet but just haven't taken that final step yet. It would be great to have a complement of vegan dishes to cover our meal options throughout the day! Looks like a wonderful book. I'd like to win a copy of Big Vegan so that if Susan ever comes to visit, I won't have to give her a cup of Bancha tea to wash down biscuits made of carob and mochi. I live with a carnivore, a vegan, and a dairy eating vegetarian. Usually I can toss something together that won't gross out the carnivore too horribly, but I can always use help with the vegan stuff. I want to win this cookbook because I'm a vegetarian and I'm always looking for new and delicious vegan food to explore! My husband and I try to eat vegetarian at least a few times a week, but it's harder for me to find vegan recipes for some reason. Not only is it healthier, but it's easier on the wallet! Also not a vegetarian but eat plenty of veggie and vegan foods. All food is delicious! Hilarious tale, though I am certain it was not the tiniest bit funny at the time. Wish we were having our virtual potluck in real-time/real-place, but this is the next best thing. I need to learn more healthy non-meat recipes! I am a meat-eater but I try to have as little as possible. But I can never think of anything! My Dad just had a heart attack and had quadruple bypass surgery. He's doing great but everything we've read said that adopting a vegan diet is the best thing you can do to for cardiovascular health. Have been looking for some great vegan recipes! I'm working REALLY hard to move my husband and myself towards a vegan lifestyle, and I would absolutely love to cook my way through this book! In the last 6 months, I've made a commitment to healthy eating. Through reading and mindful eating, I've begun to eliminate most process foods. Vegan dining proves to be a challenge for the dairy lover. Most of my attempts have been meals of blah-ness. Everyone would appreciate a cookbook that results in tasty dishes that us picky Italians can embrace. I would love to share these recipes with my friends who are finding that meats and dairy products are fitting in less with their diets for medical reasons. And of course I'm always up for new recipes, especially ones that can incorporate more vegetables into my diet. Susan I had no idea you were a veetarian in the past. I am flearting with less dairy and no eggs idea lately, so the book caught my attention. Even if I don't win it, I am glad yo share dit, I'll check it out next time I am in a bookstore. I'd love to win this cookbook because I'd love to find veggie recipes that my picky 11 year old son will eat. I have to get very creative at times to find ways to incorporate veggies he will eat into recipes, and I'd to have some new ideas. He's not as bad as some kids, and he's a little budding foodie, so I'm hoping something like this will help. I've been a vegetarian for over 15 years now. I'm currently toying with the idea of going vegan and have been trying to gather as many exciting and nutritious vegan recipes out there! I would love a copy of this book to experiment with. I'm new to eating vegan, 6 months now and I've never felt better. I'm always looking for new recipes to expand my vegan cooking experience. I'd love to win because I'm always looking for new recipes. We're not vegan, but veggies make up a huge portion of my diet. I love them! I've been vegetarian for almost a year, but I've been moving closer to a vegan diet in my own cooking lately so I would love to win this cookbook to get more recipe ideas! I love the sounds of all the recipes you mentioned so far! I didn't know you used to be a vegetarian! I'd love a copy just because dairy isn't the best for me and my family has some dairy allergies, so vegan cooking is a great way to feed everyone. Also, I like to help dispel the myth of the vegan food of yore like in your story from college. I'm always looking to expand my repertoire of delicious meatless meals. My son will eat very little meat and I try to get lots of other types of protein in him. No doubt this cook book would help me to be creative and healthy for the diet of our whole family. Also I am learning that a vegan diet is preventative with a number of life threatening illnesses, it's always worth a try in this area. I want to assault my husband with vegan recipes. I try to eat healthy, but getting an entire book full of delicious vegan recipes would help because I could spend less time scouring the internet and more time making healthy food! I'm very interested in the Vegan diet & the fact that people can survive without meat & dairy!! :) I come from a family that eats MEAT. EVERY. DAY! I can't say I'll ever give up meat but I am interested in cooking more meatless dishes (and will be amazed that it could be without dairy too!). Thanks for the chance to try out yummy Vegan recipes! I've just discovered this supercool potlick thread and I'm so enchanted by all the amazing recipes! I would love to get this for my Father for the holidays because he really enjoys exploring world cuisines. The Mango Jicama dish is right up his alley so I'm emailing him the link ASAP...many thanks!